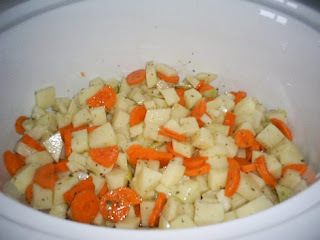 I put diced onions, cubed potatoes & sliced carrots into the slow cooker. 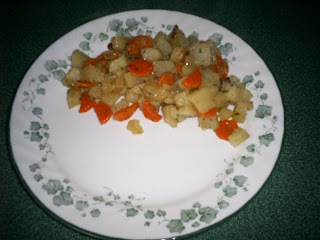 You can also use turnips, parsnips or any root vegetable. Make any combination. Enough that would fill a 9"x 13" casserole dish. Put this into the slow cooker. In a small bowl combine 2 Tbsp of vegetable oil, 2 tsps of seasoning (Mrs Dash or something similar) and a 1/2 tsp of salt (more or less if you like). Pour this mixture over the vegetables and mix well. Cook on Low for 6 hours or on High for 3 hours. It turned out quite well. When I make it in the oven, it is a bit crispy. Not too crispy, but crispier than in the slow cooker. In the slow cooker it is more tender. I like both ways of cooking it. Posted by Lisa at 12:26 a.m.